I rather enjoy living in the green area of Lokstedt and there are some playgrounds to enjoy here. You you can also go to the zoo nearby if you wish or check out even more playgrounds or the garden plots nearby. This particular playground was just installed and features experimental toys that you can see in the picture. 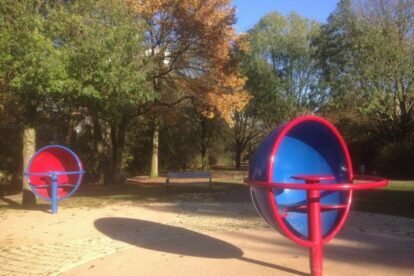 They look a little weird and I guess their main purpose is to make you feel dizzy – you can adjust your speed while sitting in them and: turn, turn, turn. But if you stop them and arrange them in a certain way – face to face – you can do a very nice sound experiment. Just whisper and in the other cabin you will be heard! This is so awesome that I had to share it. The surrounding has a little stream, fruit trees, some tables, a ping pong table and even a kind of small slack line. Usually there are not many people or kids around and the area is very relaxing. So take a breath and play! You enter the park from the street corner Koppelstraße/Julius Vossler Straße and the nearby U-Bahn is Hagenbeck (the zoo). Offline Hamburg tips? Get our iPhone / Android app!